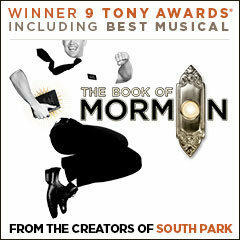 The Prince of Wales Theatre, is home to The Book of Mormon on London’s West End. Read on to find out more about the the theatre’s facilities, location, and accessibility, and how to book tickets with Attitude Entertainment - powered by LOVEtheatre today. CAPACITY: The Prince of Wales Theatre has the capacity of 1,133. BARS: The Prince of Wales Theatre has two licenced bars, The Delfont Room in the Stalls, and The American Bar in the Dress Circle. CLOAKROOM: Cloakroom facilities are available at the theatre, including a luggage storage facility if required. PRINCE OF WALES THEATRE DRESS CODE: There is no dress code at The Prince of Wales theatre. For all performances, attire should be comfortable and appropriate for the occasion. THE STALLS: The Stalls fan out away from the stage, getting wider towards the back of the auditorium. There are two half aisles dividing the seating into three sections at the rear. The section is well-raked, giving clear views of the stage over the heads of the audience in front. There is a lift in the main foyer that services the Stalls and bar. THE CIRCLE: The Circle gives a bird’s eye view of the stage and is similar in layout to the Stalls, with three blocks of seating. The whole section is steeply raked, giving clear views over the top of the audience in front, though it may not be suitable for Vertigo sufferers. There is a safety rail at the ends of each stairwell. There are no lifts that service the circle, which is 13 steps above street level. WHEELCHAIR SPACES: There is one wheelchair space in the stalls, and 8 transfer seats available. DISABLED TOILETS: There is a wheelchair access toilets in the basement of the theatre, accessible by lift. HEARING IMPAIRED ASSISTANCE: Hearing-impaired infra-red systems are available from the box office. Deposit required. GUIDE DOGS: Guide dogs are not allowed inside auditorium but staff will look after up to 4 dogs per performance. NEAREST TUBE STATION: You can quickly and easily reach the Prince of Wales theatre by the nearest tube. Piccadilly Circus is just a two-minute walk away, followed by Charing Cross Station. NEAREST RAIL STATION: If you are travelling by train, Charing Cross station is just a 10-minute walk away, followed by Leicester Square Station. BUSES: The theatre can be accessed by the bus numbers 14, 19, 22, 38. NEAREST CAR PARKS: If you’re driving, car parking near the Prince of Wales theatre can be found Whitcomb Street. NEARBY RESTAURANTS: There are a number of restaurants near the Prince of Wales theatre, including The Caprice’s American and European cuisine and The Ivy’s classic British dishes, see below for more details.